'Tis the season to bake cookies! For three years now, I've held up a very delicious tradition. From about mid-November, I make a different cookie each week in preparation for the Christmas eating frenzy that will definitely happen around here! :) Today I baked Alex's favourite Cherry Icebox Cookies. I'll probably ramp things up in December and bake two different cookies each week. I'll do some of our favourites, but each year I like to try a few new cookies. We are currently in a deep freeze. The other morning I woke up to -22C and it was so windy...that wind was devilish, it felt like it went right through my bones. Am I the only one who grows physically intolerant of cold as each year passes??? I've decided no dog walks under -5C from now on...my lungs were aching when I came home! Speaking of knitting, I found some time again! I love knitting, it's so relaxing and very therapeutic if you ask me! 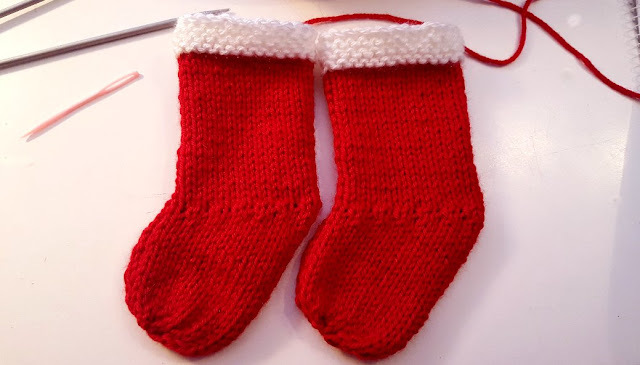 I found a very easy pattern for Little Christmas Stockings (6" version). Aren't they cute? I have two done and now I have six more to go for the pets. If I have enough yarn, I'll triple up the pattern and make two bigger ones for Alex and me. And if I have time, I may embroider names in them too. Does this count as my very first ever pair of knitted socks??? :) Just for fun, I timed myself. With some canine, feline and cheese-related distractions, each stocking took me just over 2 hours to do. I'm feeling normal again now that I have time for my hobbies! It's hard to believe we've had the two new dogs about 2 months now...that's how long it took for life to get back to somewhat normal! Look what Alex got for me this month! He orders me a new cookbook each month, usually from Amazon or Thriftbooks. This is more of a joke book than a cookbook, with recipes like "Rotten Eggs" and "Burnt Toast"...but there are excerpts from the shorts and movies, and fun pictures to see. It's a collector's item that's for sure! So what are you all up to these days? I know my American friends have Thanksgiving coming up. I'm in Christmas and Yuletide prep-mode right now. Wow cookies! And they are good for you too! Keep saying that while you eat them. They are a good survival food if trapped in a snow storm! Your cookies look amazing and your cheese looks perfect! It is cold where you are and so soon! Stay warm. I hope the freeze lets up a bit. Those cookies look so good. I feel a meal isn't complete without a nice dessert. And the cheese! You are such a good cook. I bet you hear that all the time. 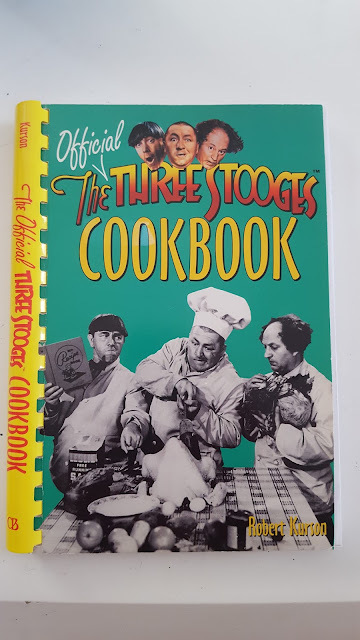 The Three Stooges cookbook must be funny and a collectors item some day. Christmas cookies!!!! Yummmmmmmmmmm! Those are really pretty too and very Christmasy looking. So, do you eat them now or freeze them for later? I know lots of people freeze cookies but I have never tried it. Your stockings are so cute! You do such a beautiful job too. So glad you got to 'sit and knit'...it's a great relaxing pastime especially when you are feeling stressed! Look at you go with the cheesemaking! I am so impressed! I'm crocheting that granny stripe shawl and ran out of yarn so I got some yesterday and I'm back at it. I am on a cleaning and organizing binge so I just do a round on breaks. The cleaning and organizing keeps me from feeling overwhelmed....so glad I am doing it. It will really help in the long run. The cookbook is cute although, I must admit I was never a fan of the 3 stooges but glad you are enjoying it. Now you've got me wanting to make stockings for 'the girls'! They are so sweet! You go girl! I won't start Christmas anything except for the gifts until after Thanksgiving. What are you baking next? Enjoy your weekend and stay warm! It was below freezing here this morning but then warmed up nicely. TTYL! Isn't everything clean and pure in the snow. One of the reasons I still get out and walk after a snow storm, even at my age, is because it's so tranquil. The cold, of course, is exactly as you describe it. Very hard on the joints, and as we both know from personal experience, the legs. Those cookies look really festive and fit right in to the holiday spirit. It's really nice of you to make good things like that every day, I'm sure your human/canine family really likes that. Men appreciate women who do nice things like that. My wife made me a big chicken and vegetable meal today, and I not only enjoy the meal but felt good she went to so much trouble for me. I liked your post. I always do like them, but I liked this one especially. as soon as i get thanksgiving out of the way, i will start xmas baking. i bake several different kinds each day. i made 1500 for the wedding in less than 2 weeks! crazy, right? So glad you’ve found a good balance with all your fur babies and you’re able to enjoy your hobbies again. And I love that Alex gets a new cookbook for you each month. That is really sweet! And fun. Thanks for sharing your cookie recipe. I love baking cookies, particularly this time of year. I have some favourites but I really enjoy trying new recipes. It makes baking that much more fun. The magical first snow storm :) I can't believe that we've had good 1.5' of snow for good two weeks already. According to the temperatures and ammount of snow, we should be half way through winter. According to the callender, we havn't even started. I hope you are able to enjoy the snow a bit. How is your winter garden doing ?? I have a tried and true cookie recipe but you have made me determined to break away. I will start with that recipe, I am now off to check for the ingredients. Those cookies look delish! Stay warm! Those cookies look scrumptious. I think I will try that recipe. 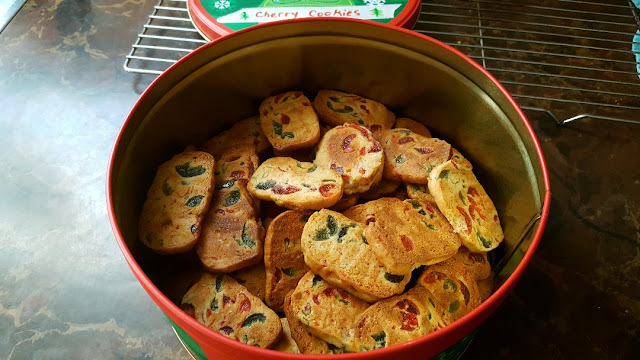 I normally do not make cookies for Christmas, but those look quite festive and I can make the changed I need to make with hubby's special diet needs. WOOHOO! Look at those Cam's making mold on them already. You have got that recipe down perfect. Cute Christmas stockings for the critters. Hopefully they have been nice so they get lovely treats. Do you make your own dog treats too? Do you have a recipe for that? The photo of the frozen terrain is so lovely. I know you are extremely cold as I did the conversion. YIKES!!! I have lived one place that would get that cold and I will never live anywhere that gets that cold again. TOO COLD! Has it really been 2 months now...wow...time flys. Those babes are glad you have them and you love them. Cookies....I love cookies. Oh crap who am I kidding...I love anything with sugar!! haha...I am now into baking bread. Loving it. How do you make those cookies you made? OMG these cookies are INVITINGLY Delicious!!!!!!!!!!!!!!!!!!!!!!!!!!!!!!!!!!!!!!!!!!!!!!!! envy your talent dear Rain! Last night we heard in news that northern parts of our country will start having snow falls from today ,we live in southern part though but temperature seem to drop quickly from now . I am sure stella will get nice warm winter coverage like jack as you are excellent knitter too my friend! Gosh it does look cold there already Rain - but knowing you all will be dealt with and winter conditions will see you managing well as I know you are so capable in so many ways!!! 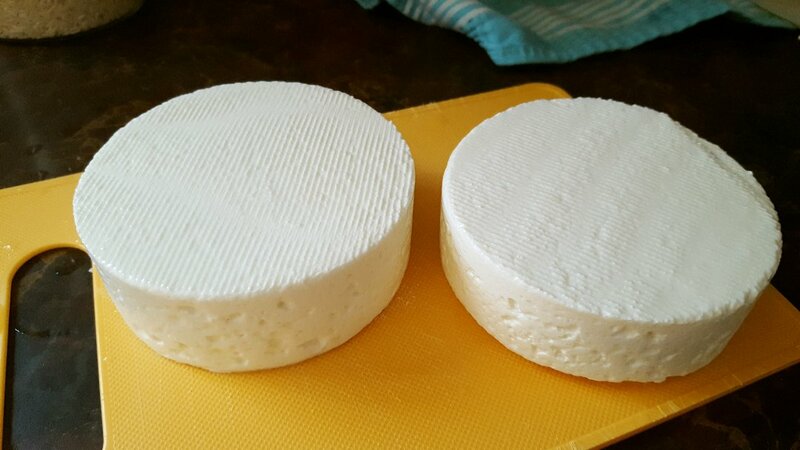 The Camemberts look awesome! This weekend I bought a lovely hunk of English Stilton (from Costco!) - enjoyed with that traditional glass of good age port (well actually a few glasses over the weekend!). This combo always becomes a winter favorite here and all that remains is to get the hearth ready for some blazing evening fires once Thanksgiving is over! We are staying home for the Holidays this year so 'home comforts' are already on my TO DO list - however we'll first have our annual short beach trip after Thanksgiving which gets us into Christmas mode. Life is good - and we are thankful for so much, good health being the most important. Stay warm - down below freezing here the past couple of nights and raining today, but sunny again soon. Dan is a Three Stooges fan and would love that book. Maybe for Christmas! Your cheeses look absolutely perfect! So exciting when one turns out so well, isn't it? And cookies and snow! 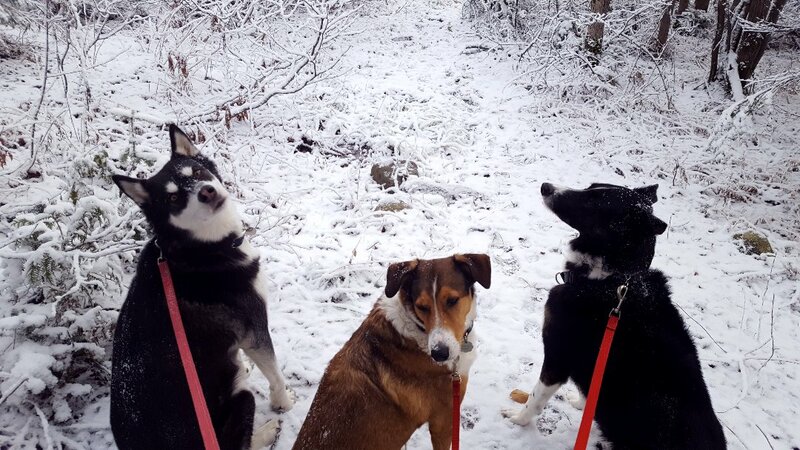 You dogs look like they're ready to go! I love those icebox cookies!! You have received the weather we had last week. We got tossed right into December weather without a blink of an eye. We are currently melting. Stupid weather. Yay for knitting again!!! I love knitting but need to find time for me to do me things. Love that cookbook!! Burnt toast!! Pfhahahahahah! Hi Gill :) You're right, they are great for survival :) And they really are good for me, at least for my emotional health lol. Thanks Christine :) The deep freeze seems to be over, but I'm still feeling cold all the time. Need to pull out the long johns! Hi John :) Thanks! The cookies are so good, they're all gone now though! Thank you so much! Alex does appreciate my cooking and I feel a lot of pride being able to make so many delicious things! The cookbook is very entertaining! Hi Harry :) Thank you :) Alex does appreciate all the work I put into our meals and sweets! That makes it fun for me too, to know that. The cold is easing up, but even just a little below zero and I'm feeling it in my bones...my exercise and supplements are really helping though I'm happy to say! Hi Joyce :) 1500 cookies! I'm not surprised that you are taking that on, but yeah, it's crazy lol! Hi Martha :) I totally agree, winter is beautiful THROUGH THE WINDOW...but the dogs can't pee through the window lol...I'm really careful not to be lazy, I put the whole gear on every time I go out now. I don't want to feel even more cold or get sick. But this is where we live right? Ha! you're funny...If I can find time to knit Stella a sweater, I'll think of you too, hee hee. The cookie baking makes it really feel like Christmas doesn't it? Especially since there is snow on the ground! Hi Nik :) I hope you can start the cheesemaking journey soon! I had a lot of ups and downs with it but I'm happy the Cams are working out! The winter garden...I just blogged about it, it seems to be okay, but everything froze...which according to the book I have is normal and fine...but I'm not seeing how the "greenhouse" effect will work to keep the plants warm enough...I guess time will tell! Hi Pam :) I hope you make the cookies, let me know how they turn out! Hi RO :) The Three Stooges cookbook is silly at its best. I mean, the author puts in some real recipes here and there, but nothing to write home about lol...it's mostly for fun! I do complain a lot about the cold, but I couldn't imagine living without the 4 seasons, honestly. 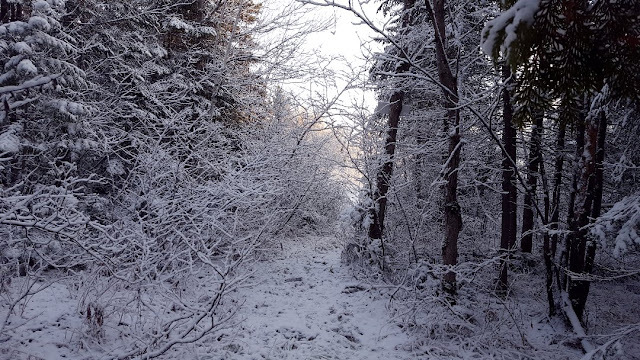 Having snow at this time of year makes everything really nice, peaceful and Christmassy. It's just that deep freeze that goes right through me that I can't stand anymore! Btw RO, I never had patience to knit before this year. Well, I did at one point, but I get pain in my hands. I found a good natural remedy, Arnica Gel, and it helps a lot so it's become more of a nice relaxing hobby for me now. But if the dogs are uppity...then it becomes a chore so I have to pick my time to knit or I'll just give it up again! Thanks Debra :) I hope your weather has warmed up a little! Thanks Marsha :) Yes, I do make dog cookies! On my side bar I have a button called Rain's Recipes and it goes to a page where I've got links to all (or most) of the recipes I've ever blogged about, they're by category and my dog treats are there. The dogs LOVE them and of course, the little stockings will be filled with them on Christmas! :) I did try a chicken bite recipe for the cats, but it didn't work out too well. At this point, they get canned tuna as a special treat for Christmas and holidays. They love that and gobble it up really quickly! I agree TOO COLD!!! Hi Baili :) Thank you! The cookies are delicious! Very sweet and festive! Do you get snow in your area? We have some good snow suits, so when we do have to go out, at least we're protected, but I still feel that cold...I need to knit MYSELF a body suit or something lol! Hi Mary :) Thank you! I'm trying my best to handle the winter! A series of insulated tunnels all around the yard and to the car would be nice lol! Oooooh I LOVE STILTON AND PORT!!! That is a nice treat! I haven't had that in ages. When I was younger...much younger!...I worked at a private club in Montreal called The University Club. Members only, very old school, no women...mostly politicians and rich men. They had a cheese platter to die for, and the main event on that platter was a huge hunk of Stilton. It sat out all day for dinner and by the time it was 5pm, it smelled heavenly. I always snuck a little piece on a graham cracker, I thought the sweet cracker gave it a nice flavour! I have to be on the look out for some Stilton for the holidays. I don't think I can make any Blues here yet, I don't have a proper "cave" for that! Lucky you, I just kind of shivered when you mentioned the beach! :) Staying at home for the holidays is what Alex and I just love to do. I try to make it as cozy and fun (and delicious!) as I can! Hi Leigh :) I like hearing that Dan is a Stooges fan, what a guy, builds barns and loves the Stooges! Lucky you! :)) Some of the autobiographies are good gifts too. I gave Alex the Larry book last year and the Moe book is on my wish list too. We watch all the shorts all the time, we have the entire collection. I find them hilarious. You're right, now that I have the Cam down pat, that will be a regular, and it's so easy to make as long as you have the right equipment!! I'm working now on making it creamier! Hi Dianna :) Yes, that's what it seems like, but here it feels like we got tossed right into February with that temperature drop. Trust me, I don't need a recipe to burn toast lol...actually I had to buy a new toaster last month. Our old one would take forever to toast everything then it one sudden moment, burn the bread. I hate buying new appliances! That's super sweet how your hubs orders you a new cookbook every week. What a variety you must have every month in meals. Jellybean used to say, "tookie," for cookie. Hi Stefanie :) "Tookie" is cute! :) The cookbooks are great, my collection is overflowing at the moment! We find most of our books used through Amazon or Thriftbooks, usually it's more expensive to ship them than to buy them. hi. am pushing 70 and every year i find winter colder. remember when you were little and your mom had to force you to come in from the snow? how you prayed for snow? hours of sledding and snowmen and snow angels? now i am actually pleased to see the sun. i don't like the humidity of the South, the place i love and where i was born, but i have begun to see why our elders who could afford it retired to florida. p.s. i love your dogs. Hi Deborah :) That's funny, I do remember being out having a grand old time in the winters and never wanting to come in, unless hot chocolate was tempting me! I hate recaptcha too lol...sometimes you don't need to click on it though. Oh gosh, I love that cookbook. How funny an idea. Burnt toast. Too too great. Those cookies look incredible and the fact you make so many in a weekely frenzy this time of year is both incredible and sounds cozy too, Rain. Winter is cold there, and is here too...but we have lots of sunshine that warms things up plus it's far dryer. I so admire people who sew and do that sort of thing. 2 hours for a stocking seems amazing to me. Love that you do such.